I've often been asked how to sew with knits. It's been a long time since I've sewn real knit dresses for myself or any other adult and even then, I don't remember having a "system". These days I am slightly better-informed but I still only use knits in clothes for the kids. So I'm just going to share what I do and link you to other people who know more. Most of the following sections aren't really How Tos; instead, they are more like Things To Keep In Mind Or Be Aware Of when working with knits. Q What are knits? How Are They Different From Wovens? Are there different kinds? A Let me direct you to two sites that say it better than I ever could. First, for the more visual learners among us, Alyson Clair on Gertie's New Blog For Better Sewing shares a couple of diagrams that explain at a glance, the difference between knits and wovens. 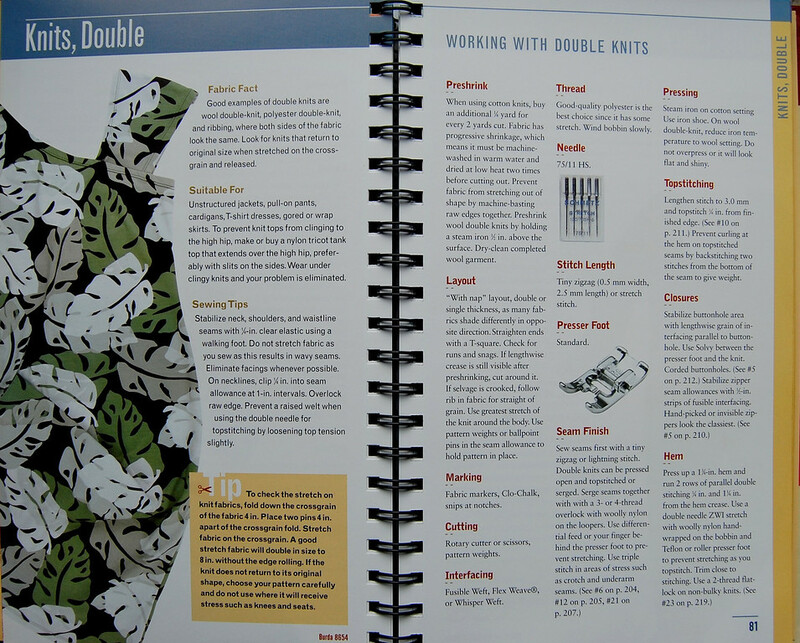 She also explains how this structural difference translates into different ways of sewing knits and wovens. Next, Bonnie from Fishsticks and Fries ran a wonderful series on working with knits. 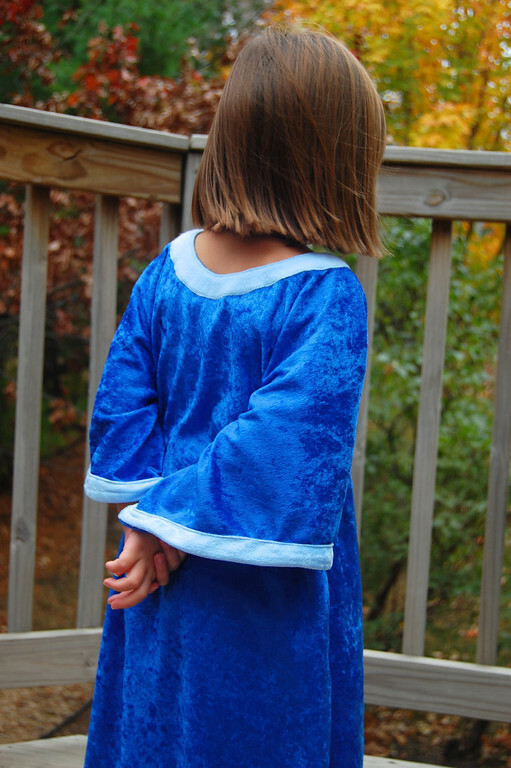 In this installment, she describes the differences between interlock and jersey. Here, she discusses rib knits and other kinds of knit fabrics. Also, Denver Fabrics (it's a shop) has a nice glossary of knit fabrics here. Aside from the way in which the fibers are knitted together, knit fabrics also differ in their fiber content. They range from 100% cotton to 100% polyester, and ratios thereof, along with elements of rayon or spandex etc. added in. These affect the properties of the knit fabric. For example, the higher the percentage of spandex, the stretchier (and better at recovery) it tends to be, and a higher cotton percentage is more comfortable on the skin for many people, and so on. The same kind of knit fabric (for instance, interlock) can be made from 100% cotton as well as 100% polyester, and feel very different to the touch. Q I'm a knit virgin. Is there any kind of knit I should start with? Are some easier to work with than others? Kinds of knit that work well: interlock. Other notions needed: 1" elastic. Kinds of knit that work well: interlock, jersey. 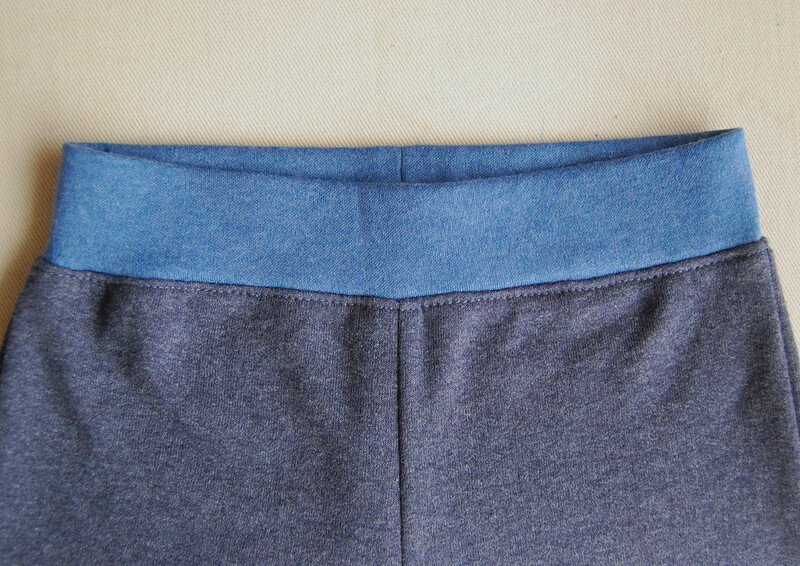 Here's a tutorial for the waistband. 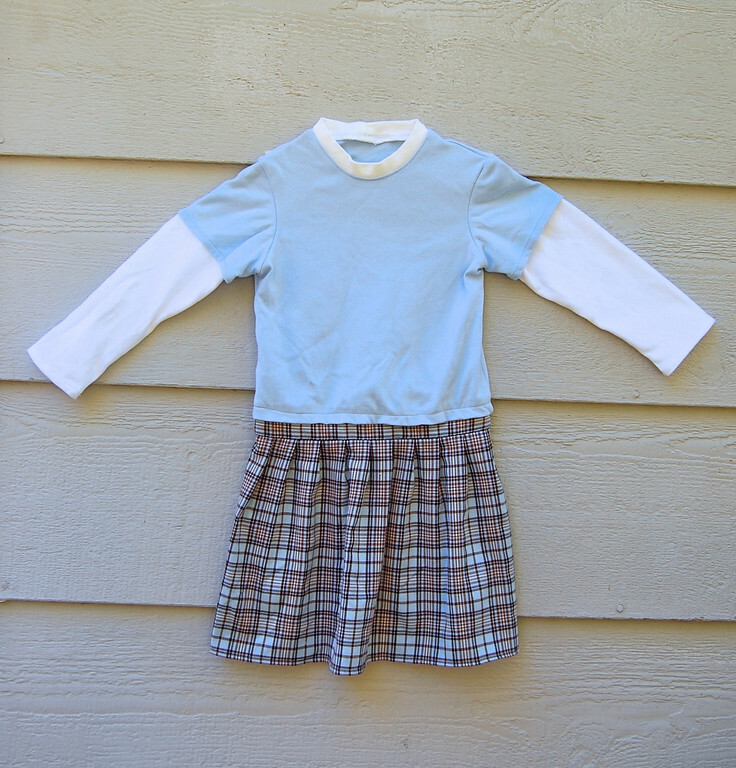 Kinds of knit that work well: Sweatshirt fleece, and interlock or jersey for the waistband. 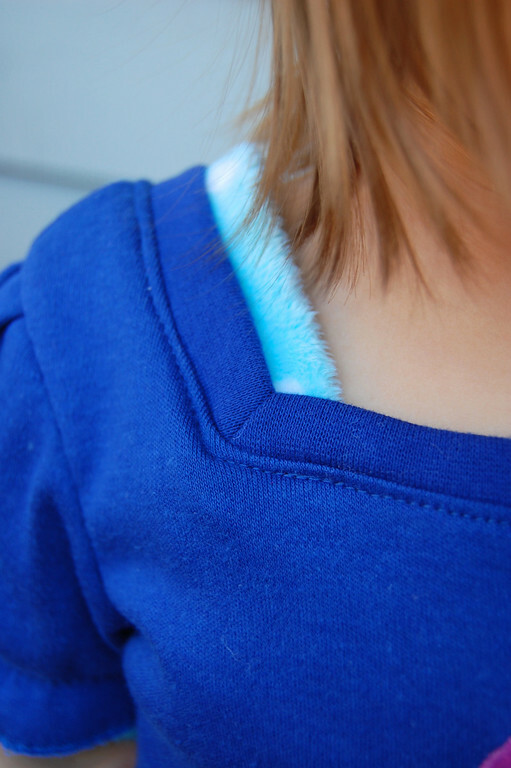 Here's a picture of typical sweatshirt fleece - it's brushed on the wrong side. If you have a good pattern for fitted yoga pants, make that in a spandex/Lycra knit for a snug fit. Other notions needed: 1.25" to 1.5" elastic. Here's a tutorial, linking to the original tutorial. Kinds of knit that work well: Interlock, jersey, stretch velour, pile knit. 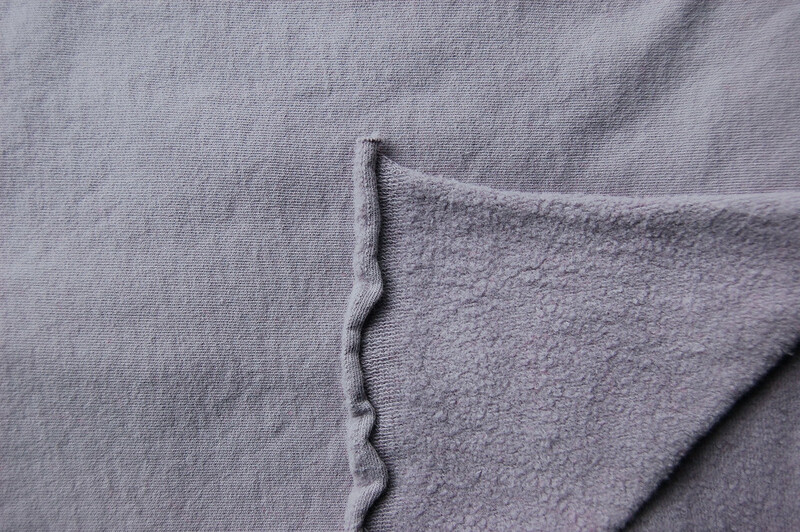 Other fabric needed: Ribbing for the neckline, or a more rigid fabric for a neckline facing e.g. fleece. Kinds of knit that work well: Tshirt knit, interlock, sweatshirt fleece. Other fabric needed: Ribbing for the neckline. Kinds of knit that work well: spandex/Lycra knits, generic swimwear knits (what some retailers call them), jersey. Other notions needed: swimwear elastic, clear elastic, underwire frames, buckles etc. Kinds of knit that work well: Various, depending on the garment. Other notions/fabric needed: Stabilizers e.g. 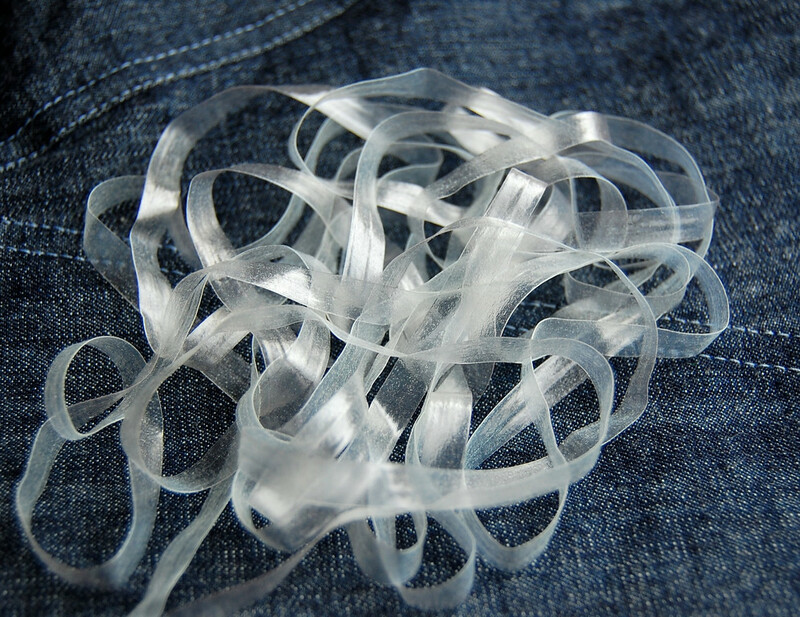 clear elastic, fusible tricot, zippers etc. Q Do you need special equipment, notions or techniques for working with knits? A In general, using specialty stuff helps. It helps with the quality of your work, it helps with the ease of working with the more unusual (i.e. 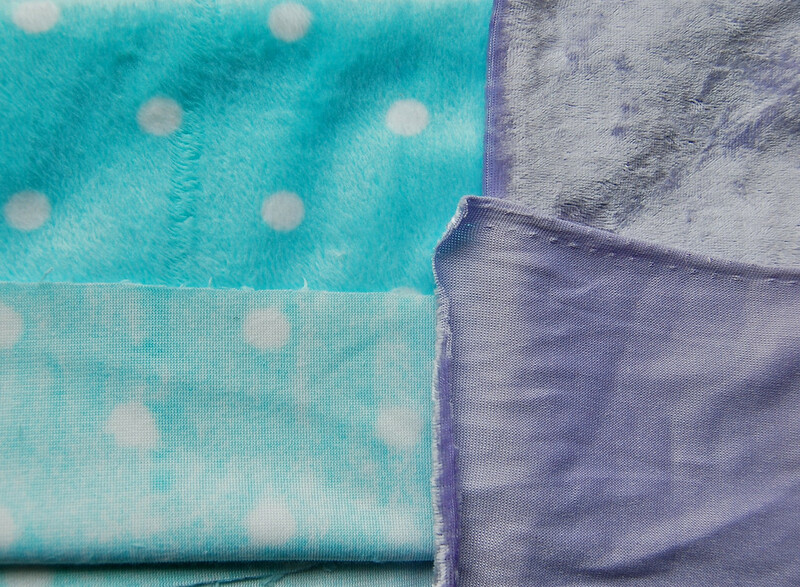 not regular cotton) fabrics, it helps with getting certain special effects in your sewing. But it also works by making you feel as if you are more able to succeed. In other words, there is a psychological element to using fancy gadgets and notions that makes people feel more confident. There is nothing wrong with this. But it also means that you don't need to own or use all these special things in order to attempt your first knit garment. I am always astounded by people saying things like, "I've been wanting to try sewing a knit dress/linen tunic/ruffle top/whatever but I've heard you need a serger/coverlocker/specialty ruffle foot so I'll wait until I get one." Friends, don't let what you don't have stop you from using what you already do have. 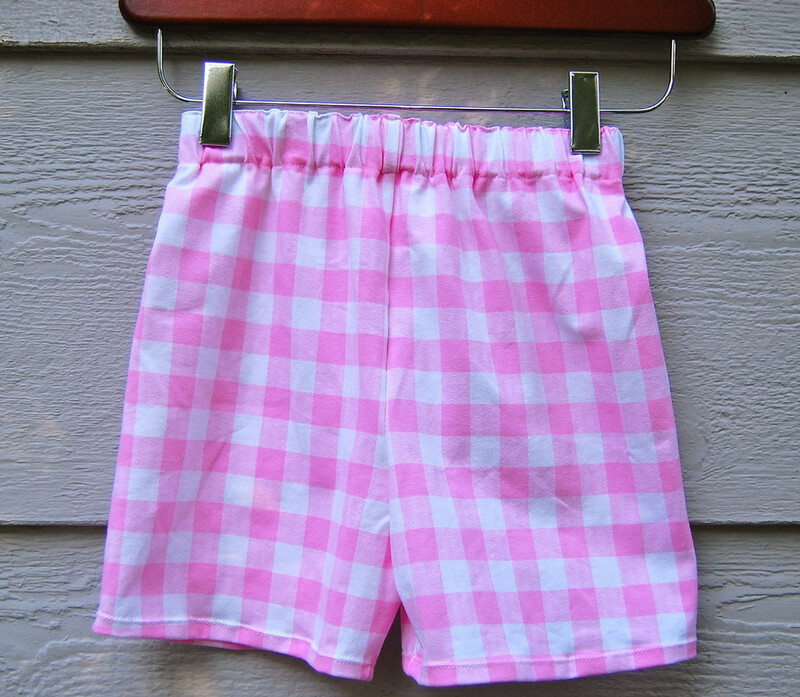 In the days before I owned a serger, or discovered ball-point needles, or used woolly nylon, I sewed dozens upon dozens of knit shorts and footed infant sleepers with regular polyester thread and brandless needles on my regular non-computerized sewing machine using BOTH the humble straight and zigzag stitches. Yes, it can be done. It depends on where on the garment you use them, and how much stretch you need in that part of the garment. Here's another post to read on how to use a zigzag stitch for more stretch. All that said, one gadget that really helps me in sewing knits, attaching elastic and shirring is my walking foot. My machine comes with this foot (black thing at the back of the presser foot) integrated, but you can buy it as a separate attachment in other brands of machines. The walking foot feeds the top layer of fabric under the presser foot. In the case of knits, this prevents it from slipping in too quickly and actually stretches it backwards slightly. This is especially helpful when manually stretching knits (like ribbing for necklines) while stitching. Q Yeah, yeah, so, do you actually need a serger or not? 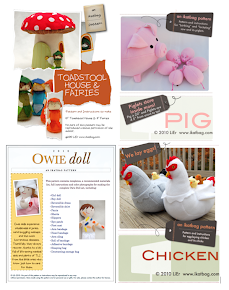 A Are you sewing commercially? If you are selling the garments you sew, then yes, invest in one. It makes your garments look more like the sort you can buy in shops. Don't ask me about whether it makes your garments look professional or not - I've seen awful garments (fit, finish, workmanship) sewn with beautifully-serged inner seams, and I've seen beautiful garments (fit, finish, workmanship) sewn by people who don't own sergers. If you're sewing garments - even knit ones - for your own use, don't feel compelled to buy a serger unless you want to. 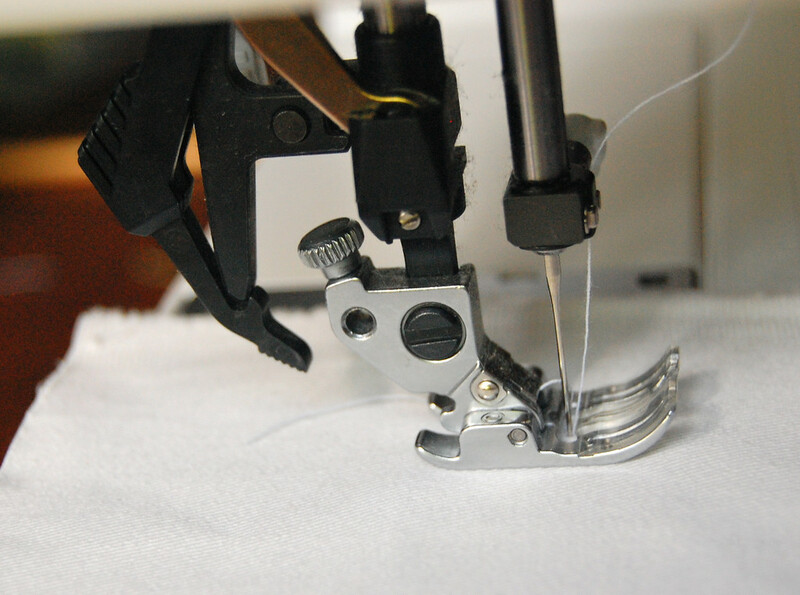 You can use a zigzag stitch on your regular sewing machine to finish seam allowances. And some modern-er sewing machines even have an overlock stitch among their other lovely embroidery stitches. Maybe yours already does. One thing that sergers are handy for on knits are rolled hems. But, let me disclaim, these are decorative. By adjusting the differential feed, for instance, you can get them to ruffle. Notice that if you set the differential feed in the opposite direction, you can get the edge to contract. This will not produce anything particularly decorative, but it will help make a flat edge on something you don't want to accidentally ruffle, like the hem of a circular knit skirt. Q And coverlockers? What about coverlockers? A Sure, buy them if you have the money and inclination. They're the machines that produce the double rows of stitching on the hems and sleeves of your Tshirts. 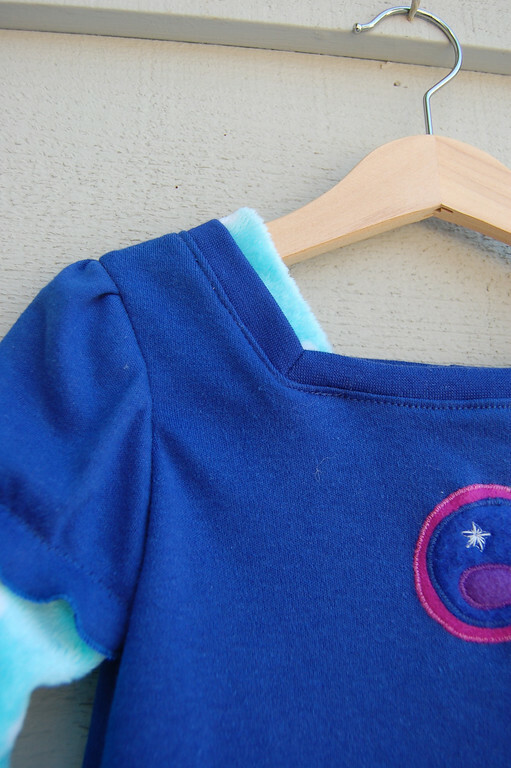 Want to make a mock coverstitch using twin needles and a regular sewing machine? Check out this excellent tutorial. Q What about ball-point needles? Must I use them? A There are two kinds of needles that are popularly used with knit fabrics. One is a stretch needle and the other is a ball-point needle. Ignore the red mark on my needle case below - it's just to remind me of which needle I've used so I don't mix it up with the brand new ones. BOTH kinds are have rounded tips, which allow them to slide between the fibres of any knit-type fabric without catching those fibers the way a normal universal pointy needle might. Stretch needles have (if I understand right) an additional feature - a specially-configured shaft that allows the thread to form a deeper loop to facilitate catching the bobbin threads underneath i.e. less skipped stitches. You use ball point needles for general knits and the stretch needles for the extra stretchy knits like swimwear and lycra and stuff like that. I use both, but never discerningly. And sometimes I forget to swop needles so that I only realize when I'm almost finished with a pair of knit shorts, that I'm using a regular needle. 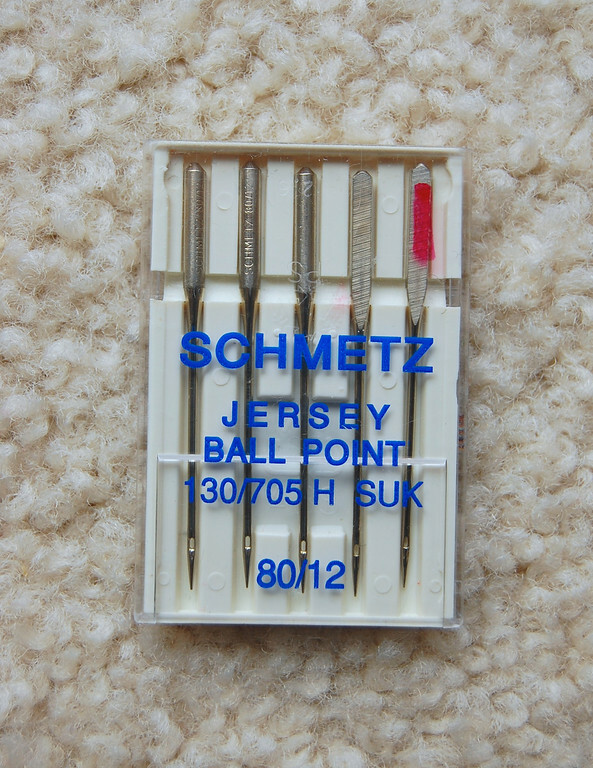 With certain kinds of knits (like interlock and pile knits), the difference is indiscernible, but with other kinds of knits (like jersey), using one of these ball-point/stretch needles does make a difference. It is nice to have these specialty needles on hand at that moment when you realize your stitches are skipping and wonky and you want to tear your hair out. Especially since they are very inexpensive! Q Do you need special stretchy thread to match the stretchiness of the fabric? A I use regular polyester thread. Polyester thread comes in many grades. Some of it has more give (i.e. less rigid) than others. But none count as "stretchy". When I think of thread "being able to stretch with the knit fabric", I am really only concerned with the seams of the garment that need to stretch with movement, or when the garment is put on or removed. For example, the neckline/collar and the horizontal shoulder seams in tops, and the waistband (and, to an extent, the crotch seam) in bottoms. 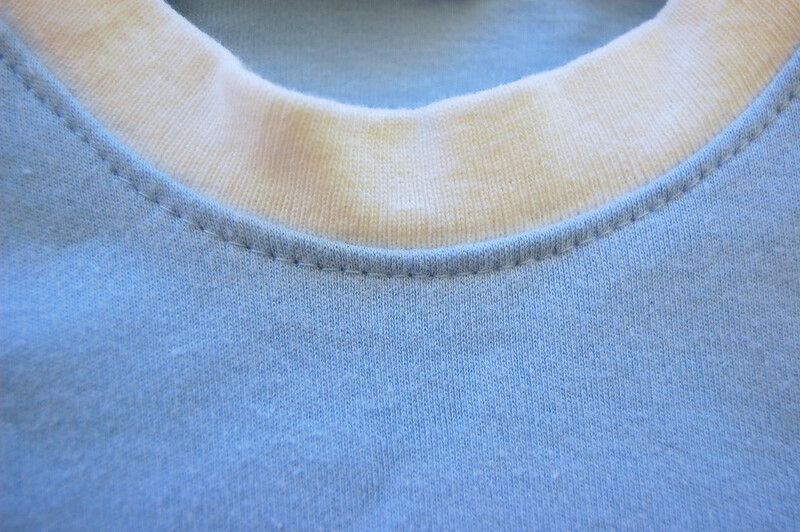 There are different techniques for sewing these seams to allow for stretch, to be discussed later. I mostly use it to edge baby blankets because it stretches through the serger when being sewn on, and then relaxes into a pretty, fuzzy stitch. I haven't used it yet for knits because I haven't needed it. 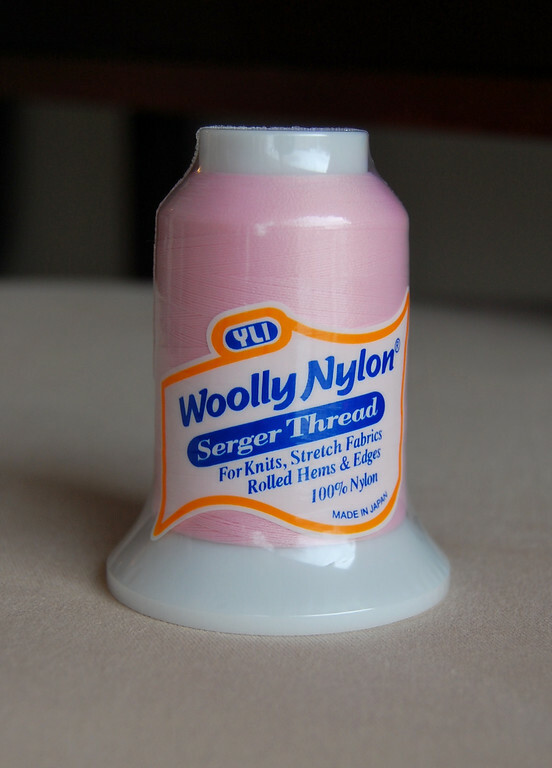 Also, I have so far only used it in my serger and not in my sewing machine. I have heard, however, that it is not strong enough for intense-stretch garments like leotards and swimwear. For those, elastic is better used to stabilize hems and seams. See next question. Q So how then do you make a stretchy seam or hem? A If it's a very stretchy knit, like rib knit, just gently stretching the seam when sewing it might be sufficient. The fabric relaxes back to its original dimensions, but stretches under stress when being worn. The stitches will not snap unless this seam is stretched beyond what it was when it was sewn. If it's a knit fabric with a lower stretch factor (like Tshirt knits), then woolly nylon can be used. Or else elastic. I like this clear kind, but you might also see the white version in swimwear and leotards. Hold the elastic on along the length of this seam, stretch the elastic and the seam allowance together, and sew the elastic, using a zig-zag stitch, to the seam allowance. Whenever you are sewing a seam with regular polyester thread, stretch the fabric slightly in both directions (behind and in front of the presser foot) to allow the stitches some 'give' when the fabric recovers back to its unstretched state. Q What about elastic thread? A The thick white kind that people use to shirr sundresses? Save that for shirring. It's too thick to thread through the eyes of most home sewing needles but it's good for hand-winding onto bobbins for shirring. With it, people can make wovens impersonate knits, but there's nothing like wearing the real thing. It has ribs (hence the name) and has a good stretch-and-recover behavior. It often comes as a tube knit on a bolt i.e. it is knitted into a tube - there are no selvedges- and is sold by the yard. 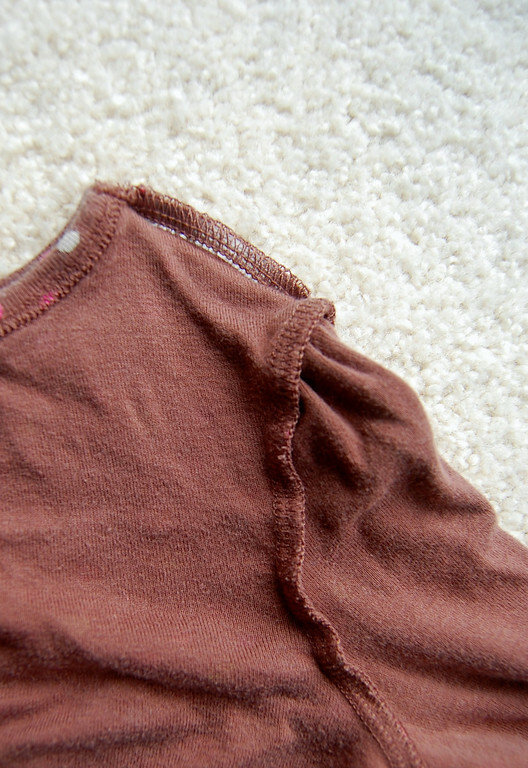 This is a good tutorial on how to sew a ribbed neckline for a garment like a Tshirt. I've learned that the smaller the ribbing circle is compared to the neckline circle, the flatter the final neckline will lie. This is because the outer (unfolded) edge of the ribbing will have to stretch more to accommodate the larger garment neckline, making the entire ribbed loop lie flat rather than stand up. This is how it will look against the neckline. To attach it, you will actually need to flip it upside down so its seam allowance lines up with that of the neckline. Note: This entire outfit was experimental for me. I was going to add an inner layer of that pale blue pile knit (see later photos) which seemed to me like it would make the overall neckline tighter. Since I'd never done this double-layer nonsense with knits before, I thought I'd give extra stretch allowance by making the angular blue ribbing the same size (rather than smaller, which is the common-sense thing to do) as the neckline. On hindsight, I should have stuck with common-sense. Summary: Always make the ribbing loop smaller than the neckline. 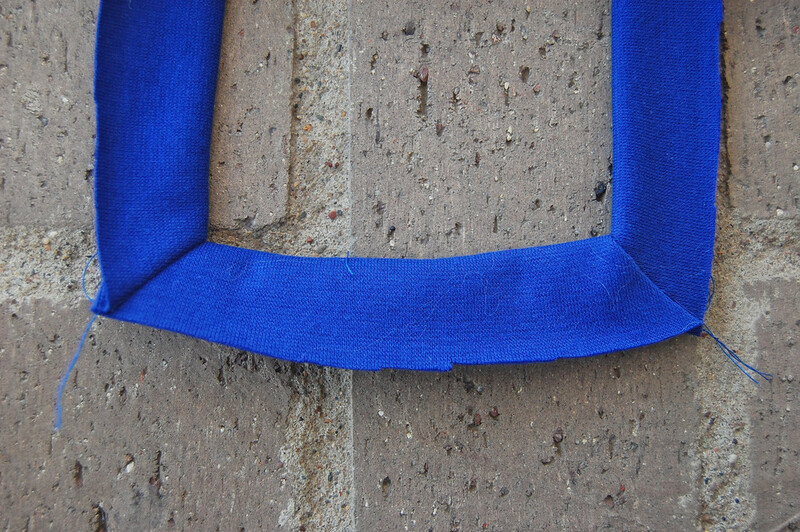 You can then top-stitch close to the seamline to secure all those layers of seam allowance. 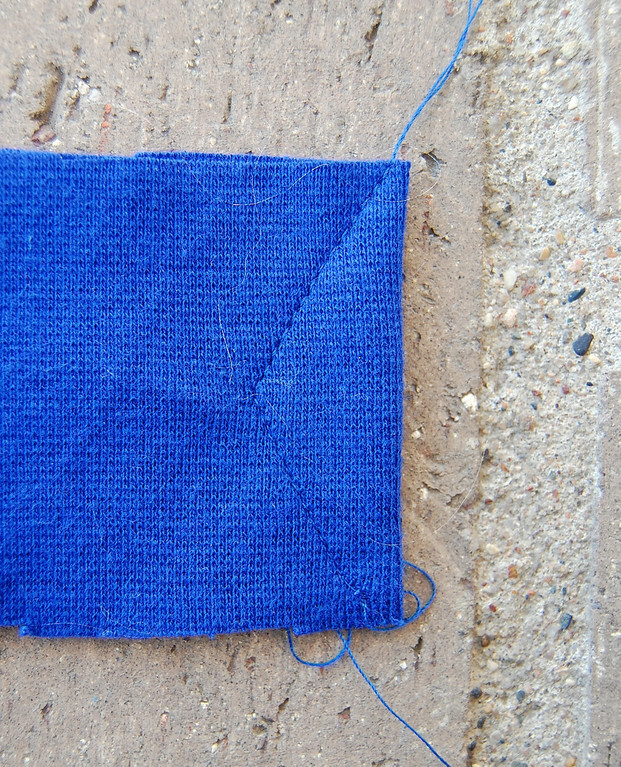 Here, the additional inner layer was attached with that very line of top-stitching. 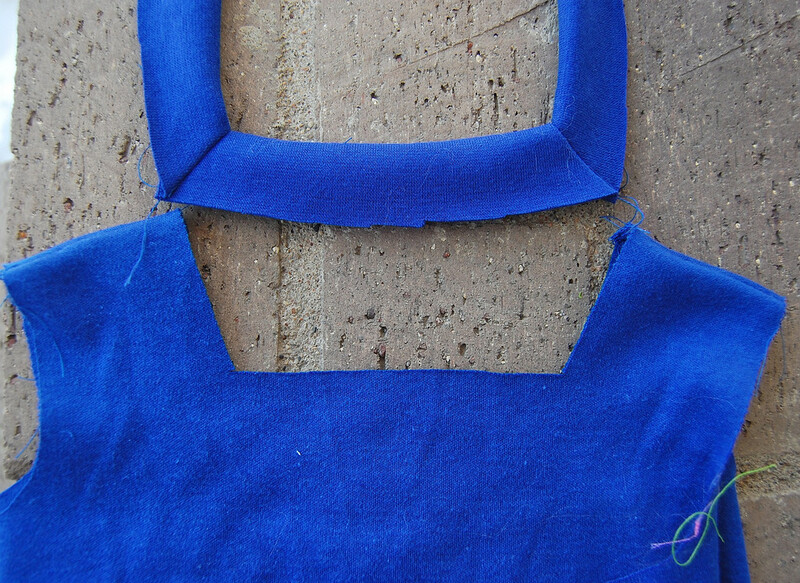 This square neckline has four of those corners, but you can use just one, acute corner on V necklines, too. 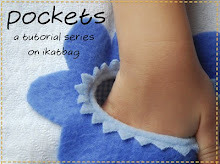 Q Do you need interfacing when working with knits? A When necessary, yes. Just like in garments made from woven fabrics. I have never needed any in my knit garments, but if you do, try fusible tricot. It's stretchy and thin. The only times I've felt like I wish I had some on hand were when appliqueing. But since I usually only add applique to already sturdy knits (like interlock), I just ironed on some spray starch to stabilize the area before stitching on the patch and it worked well. Q Can you use the same sewing patterns for knits as you do for wovens? Will they end up being looser? A I am unfamiliar with commercial patterns, but I'll say that any decent pattern should specify whether it is meant for knits or wovens. Further, if it is a knit pattern, it should also include adjustment instructions (and tables) to work with the stretch factor of whichever particular knit fabric you use. Essentially, you stretch a fixed length of fabric (cut so that its length is along its stretchiest direction) till its limit is reached (usually some evidence of distortion in the weave or ribs will help you know this point). Measure how beyond its original length it's been stretched, and take this as a ratio of that original length. This is the stretch factor. 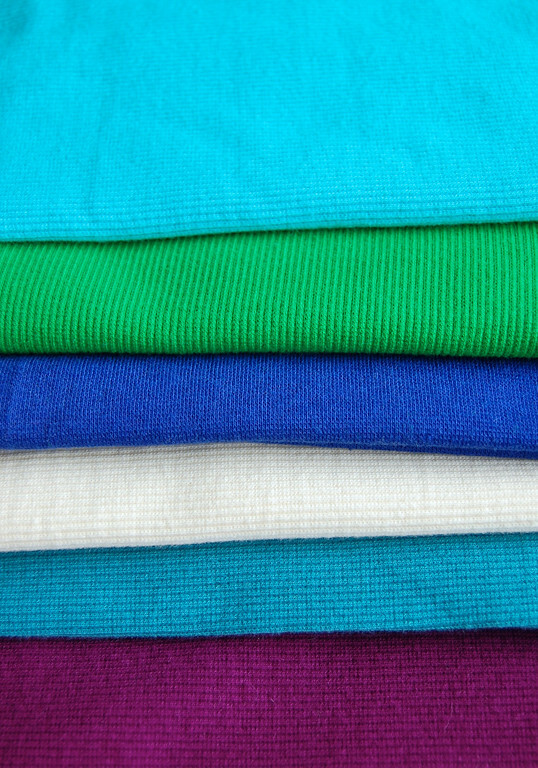 Some knits (Tshirt knits, sweatshirt fleece for instance) have very low stretch factors and some knits (lycra/spandex knits, some jerseys, for instance) have very high stretch factors. The exact same sewing pattern (e.g. a size-12 dress), taking into account these stretch factors, will have different dimensions at various points for different knits fabrics. how the stretch factor of a knit affects patterns and pattern shaping. Q Any other special tips for working with knits? 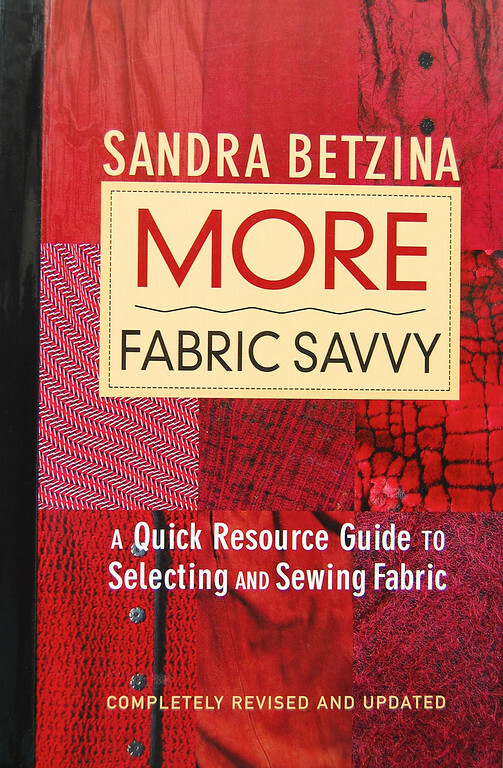 A I have this book, which I refer to whenever I start out with some new fabric that I've never used before. Some very useful pointers in there. Otherwise, scour the internet for other sites on sewing with knits. Sometimes all it takes to get you started is not so much knowing the answers, but finding the right questions to ask. And now, over to you: what resources and tips do you have for working with knits? Please share them in the comments! Thank you for demystifying knits. I confess I've had mixed results, and am very gun-shy to try again. I think I just didn't have enough good info on what to use with what I have. Chris - mixed results is what I got too, when I first started sewing with knits. For the longest time, I couldn't understand why some knits caught on my needles and some didn't. Or why some rolled and some didn't. And why the stitches kept breaking at the shoulder seam. No doubt tomorrow I'll find out some new thing I didn't know about knits previously! We're all always learning, whether or not we planned to, I think! Wow! I didn't realize how little I knew about all those knits I used to sew on! ;) Always good to learn more - thanks! Thanks so much for writing all that and adding links. It's definitely one of your posts I'll need to re-read a few times before I absorb all the information! I've got a stash of knits in my drawer upstairs that are waiting to become garments (skirts, I think) so this information will be put to good use. P.S. Any tips for top-stitching knits? Do you sew the seam allowance down with the top-stitching? wow, this was so helpful! thank you so much. i've been wanting to sew myself a knit skirt and have been scared to try it - but now I'm excited to go ahead. thank you! Laura: I don't usually top-stitch knits. Unless you stabilize that particular edge e.g. if it's a neckline of a knit dress that you don't want to stretch, you might face it with some stabilizer (interfacing) and /or a facing, and then top-stitch through those layers. Knits stretch too much for top-stitching to be worth its decorative effect. 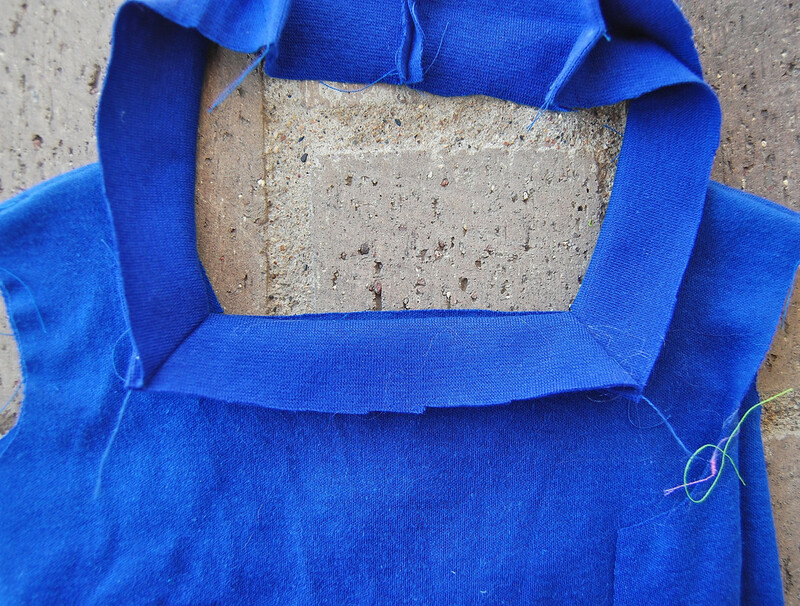 Coverstitching is an alternative - the two rows of stitches work better than a single row of top-stitching. I do top-stitch along necklines after attaching ribbing, because stretching it slightly (as is inadvertent in topstitching) is not a bad idea for this edge. It seems so funny to me that young sewists are afraid of knits. I did tons of Stretch "N Sew knit sewing many years ago, and find sewing with woven fabrics to be very frustrating! No give. I think that sewing knits is Fun and Fast. Your hints are all right on track, and I learned a few new things. Thanks. but I will not ignore the red mark on your needle case! that's brilliant - just the system I need! Thanks! My attempt at top stitching didn't look right - now I'll stop trying or look into coverstitching! Me again. Another question: do you ever sew a seam with your regular machine and then use the serger just to finish off the edges? Is that redundant? Yes. My serger is now almost-permanently in single-needle mode, so I ALWAYS sew seams first, with the sewing machine, and serge the seam allowances after. This goes for both knits and wovens. If I were sewing a LOT of knit garments, I would put back the second needle, which provides the row of safety stitches, and then I wouldn't need to sew the seams on the sewing machine first - I'd run the seam off the serger immediately. I would do this for general fuss-free seams like straight seams and gently-curved seams like the crotch seams of pants. UNLESS it was an awkwardly-shaped edge, like an armscye that neeeded a set-in sleeve (or any sleeve). Then I would still sew that on the sewing machine first, so I could ease it in gently, and then serge the S.A. after. (b) the seam/edge was one that didn't require special care. Wow. You're always so thorough. It must take you hours to make these sort of posts. Great tips! 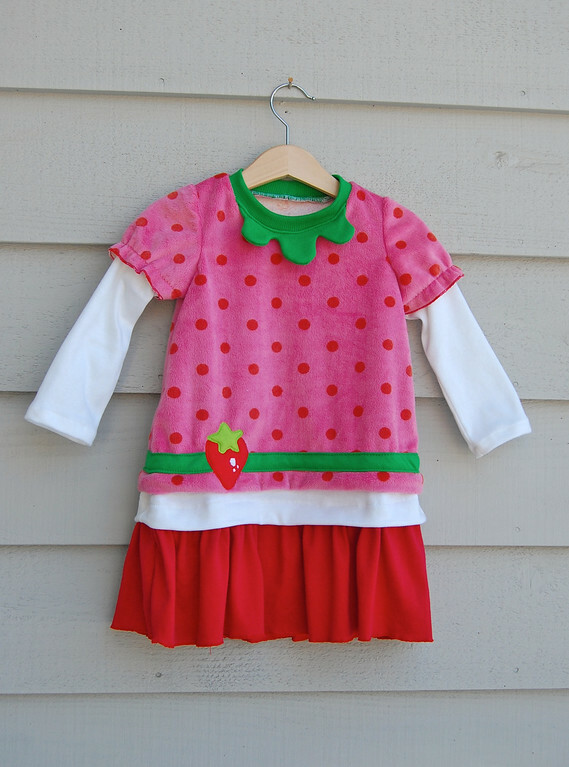 I've been working a lot with upcycling old t-shirts into dresses, skirts and such for my daughter. I really need to get on posting some of them. thanks for this - a few friends and I were wondering about sewing with merino - this might sound really stupid, but do you pull the fabric (take the stretch out of it) as you sew, or do you just sew as you would woven fabric? Apologies - I am a MAJOR novice sewer! Miko, I'm afraid I've never worked with merino before! I assume you mean the merino wool fabric, right? I've hardly ever sewn with wool-that-was-supposed-to-still-stretch-after-wearing (e.g. a sweater rather than a coat) so I can't share anything at all from experience. I'm just going to say that if you're intending it to be stretchy after wearing i.e. you don't intend to line it and turn it into, say, a blazer or winter coat, I would sew it the same way as you would with knit. However, wool doesn't have a very good recovery behavior when you stretch it, the way something with spandex in it, might. This means if you stretch it like you might stretch swimwear knit or even ribbing, your wool seams will be awful and wavy. So I wouldn't pull when I sew. If you have a walking foot, it will help stretch each seam very slightly as you sew, and that might be sufficient to give the seam enough elasticity not to break when the garment is worn. I've found that using smaller stitches rather than longer, is helpful. If the garment is a loose one, then you'd just sew it exactly as you would a woven (just the sewing part, I mean, not the pattern-drafting, which is always a different way for knits than for wovens). Sorry I couldn't be more help. Thank you so so so much for this post! I will have to come back to it and read it very carefully when I have more time! I have never sewn with knits, and I am a beginner at sewing. 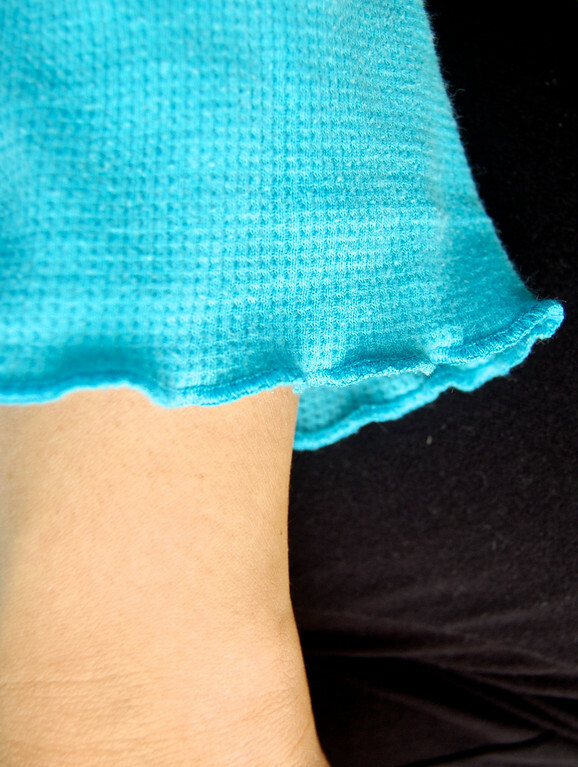 Can you use a rolled hem foot to hem knits? 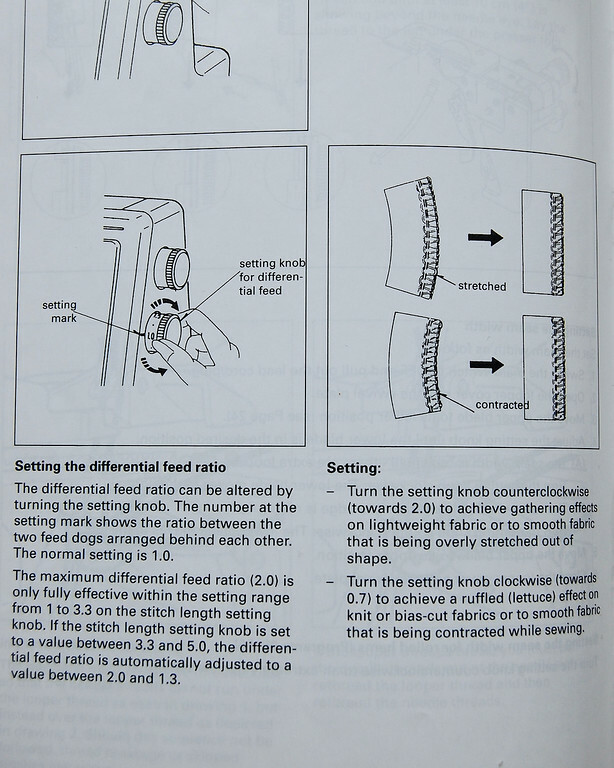 My Brother machine comes with a setting for stretch, is it what I should use when sewing knits? Do I need the walking foot? Can I use it with the stretch setting? 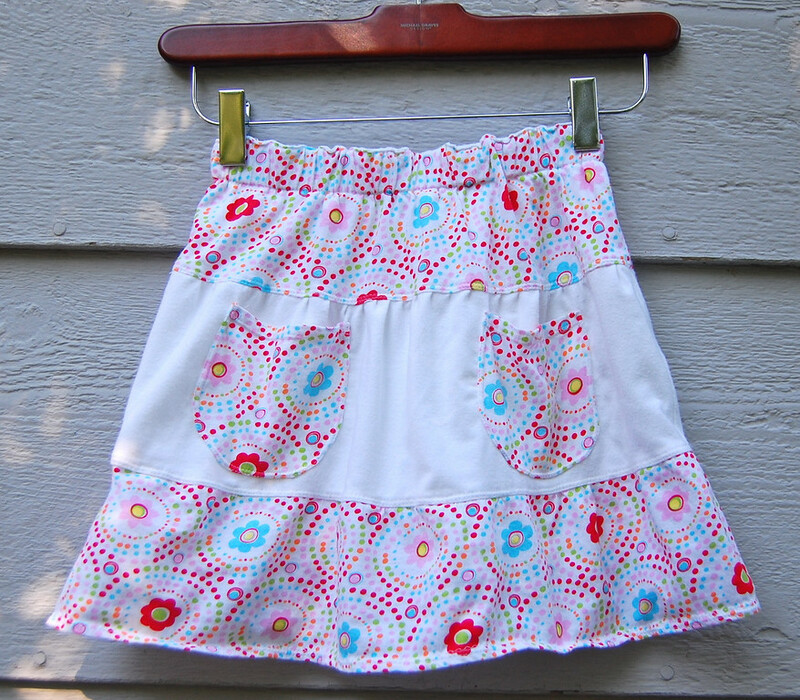 Everything seems so complicated I am intimidated, at yet would like to try sewing knit shorts for my little daughter. Thank you so much for your wonderful blog and generosity in sharing your knowledge. 1 Rolled hem foot - I don't know, honestly. I don't have this foot, and I've never used it, so I can't say. If you already own one, there's absolutely no harm trying it on scrap knit. If you don't, I'd suggest you NOT go and buy one specially for knits. 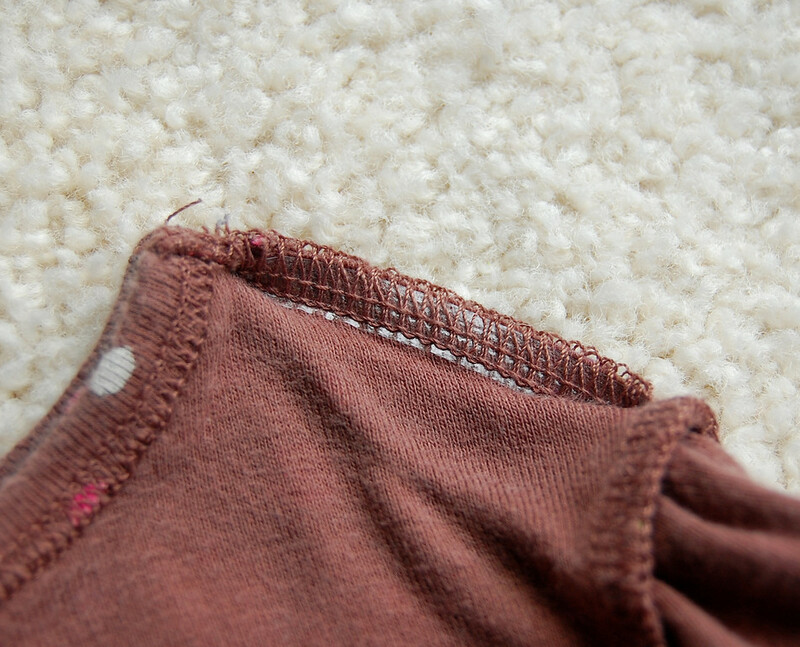 You can hem a knit garment the more "proper" way - fold up the narrow hem twice (so the raw edge is hidden away under the second fold) - and sew a straight stitch. If I am particular about my workmanship, I ALWAYS hem my knit garments this way - it looks more professional. But if I'm feeling shoddy that day, or just in a rush, I do a rolled hem (on my serger). Moral of the story: straight stitch narrow hem on regular sewing machine is nicer looking than rolled hem (on any machine) any day. 2 Stretch stitch: Not necessary. I've NEVER used the stretch stitch on my machine, except when sewing elastic ends together to make a loop. Even then, I only use it when I remember. Use your walking foot and use a straight stitch for regular seams. If you need the seam to be stretchy (like a waist seam, or a yoke seam, or the shoulder seams, use 1/4" clear elastic in the seam allowance instead. I also don't use a zigzag stitch EXCEPT when I'm attaching elastic directly to the fabric. Summary: Straight stitch, with walking foot, works. No need for stretch setting. Use elastic if you need a seam to be stretchy. this is so helpful. 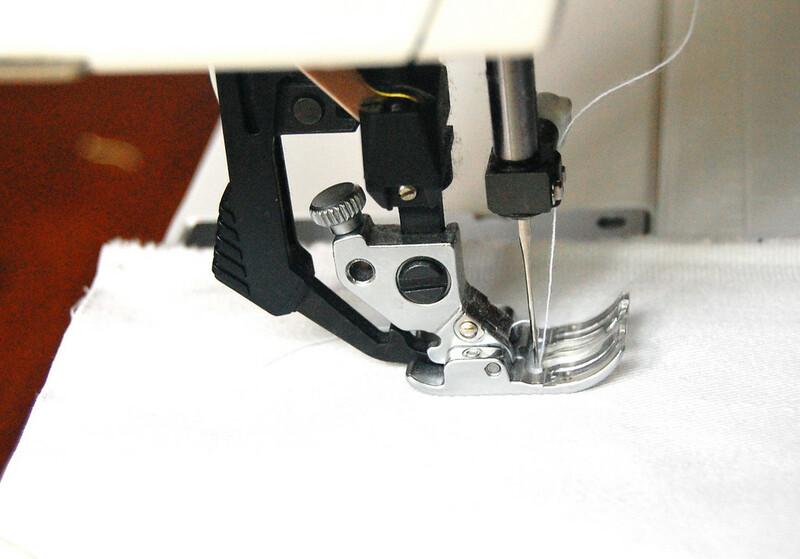 I will install the walking foot on the machine--never used before, and use the straight stitch. I had no idea that jersey is better than interlock--I still am a little confused by all the different terms, so thank you for this tip too! You are a great teacher, I have bookmarked every tutorial you have published, and reading your blog has been what has encouraged me to try finally sewing, which I always wanted to but thought would be too difficult for me. I apologize that I ask so many questions, but I was shopping for jersey and found only some 100% cotton, while others (the most available where I browsed) were a combination of either 97% cotton and 3% lycra, or 97% rayon and 3% lycra. So now I am not sure what I should go for. Would those be good for short or only for t-shirts? Anna, all those are OK. What might be most helpful for you (more than considering the fabric content) is to TOUCH the fabrics themselves and ask yourself which ones feel similar to the fabric of garments you've seen (e.g. shorts you own, or have seen in stores). Then you'll know which kinds are best for shorts, Tshirts, skirts, dresses, and so on. In my fabric store, some knits are even called "sweatshirt knits" or "Tshirt knits" which tell me what they're commonly used for! Buy a yard of some of those fabrics you saw, and experiment with them. Over time you'll know which ones you enjoy working with most. Thanks again for your help LiEr! I will choose one (on sale since this is my first attempt) and I am all set to try.